"T" Barbell with Beachball Ball and Crossing Beachball spinner barbell. Barbell with Cat Eye Stone with Steel Threaded inserts for perfect fit. 1000 PIECE ASSORTMENT OF COLORFUL ACRYLIC BELLY AND TONGUE RINGS IN ALL OUR TOP SELLING STYLES. THE SHAFTS ARE MADE OF 316L SURGICAL STEEL, 14 GAUGE 7/16" AND 5/8" RESPECTIVELY. YOU WILL RECEIVE 500 OF EACH. Colorful Acrylic Belly/Tongue Rings 2500 Pack Mix - 10 cents each! 1000 PIECE ASSORTMENT OF COLORFUL ACRYLIC TONGUE RINGS IN ALL OUR TOP SELLING STYLES. THE SHAFTS ARE MADE OF 316L SURGICAL STEEL, 14 GAUGE. U.V. DICE DOOR KNOCKER TONGUE BARBELLS IN BLACK,RED,BLUE,CLEAR AND PINK UV DICE. 14 GAUGE 5/8" ,TOP QUALITY 316L SURGICAL STEEL. 100 PACK Bright Colors Of UV Ball Barbell with Matching Color UV Lifesaver Donut. - Measurement: 14 Gauge, 5/8"
316L Surgical Steel Barbell with Epoxy Flame Skull Head. 14G 5/8"
100 PIECE ASSORTMENT OF TONGUE BARBELLS IN A BIG MIX OF DESIGNS INCLUDING 3 COLOR CANDY STRIPES,TRANSLUCENT BEACH BALL,RIPPLE WAVE,CLASSIC BEACH BALL,TORNADO TWIST BALL, UV, GLITTER, GLOW,CRISS CROSS STRIPES AND MORE.TOP QUALITY FLEXIBLE SHAFT,U.V. REACTIVE BALLS 14 GAUGE 5/8" (16MM) LENGTH BAR. "T" Barbell with Glow in the Dark Ball and Crossing Glow in the Dark Spike barbell. 14K GOLD PLATED TONGUE BARBELLS,CHOOSE YOUR LENGTH BELOW.316L 14 GAUGE 14K GOLD PLATED. 1000 PACK OF HOT SELLER SS TONGUE BARBELLS IN ALL OUR HOTTEST SELLING LOGO DESIGNS SHOWN BELOW AND MANY MORE NOT PICTURED! TOP QUALITY 316L SURGICAL STEEL 14 GAUGE 5/8" (16MM) LENGTH BAR. PEACE SIGN TONGUE BARBELLS IN BLACK AND CLEAR.COMES IN GLITTER AND SOLID ENAMEL STYLES IN COLORS SHOWN BELOW. VERY COMFORTABLE TO WEAR AND VERY IN FASHION! 316L 14G 5/8"
U.V. BALL REBEL FLAG TONGUE BARBELLS IN 8 COLORS SHOWN BELOW.TOP QUALITY 316L SURGICAL STEEL 14 GAUGE 5/8" (16MM) LENGTH SHAFT. 100 PACK OF 14G PLAIN STEEL TONGUE BARBELLS IN ASSORTED LENGTHS.TOP QUALITY 316L SURGICAL STEEL. TITANIUM ANODIZED MARIJUANA LEAF TONGUE BARBELLS IN BLACK,PINK,DARK BLUE,RAINBOW,LIGHT BLUE AND GREEN.TOP QUALITY 316L SURGICAL STEEL TITANIUM ANODIZED.14 GAUGE 1/2"
TITANIUM ANODIZED BALL TONGUE BARBELLS IN 14 GAUGE 5/8"
BUTTERFLY TONGUE BARBELLS IN ASSORTED COLORS SHOWN BELOW.AVAILABLE IN EITHER 316L SURGICAL STEEL OR FLEXIBLE PTFE SHAFT. 14 GAUGE 5/8" (16MM) LENGTH BAR. Bright Colors Of UV Ball Barbell with Matching Color UV Lifesaver Donut. 100 PACK OF U.V. 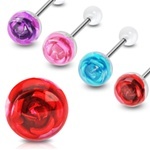 ROSE TONGUE BARBELLS IN AN ASSORTMENT OF COLORS SHOWN BELOW 9 COLORS IN ALL.TOP QUALITY 316L SURGICAL STEEL 14 GAUGE 5/8" (16MM) LENGTH SHAFT. TOP QUALITY 316L SURGICAL STEEL 14G 7/16" VALENTINE'S HEART TONGUE BARBELLS. TOP QUALITY 316L SURGICAL STEEL 14G 5/8" (16MM) LENGTH SHAFT.